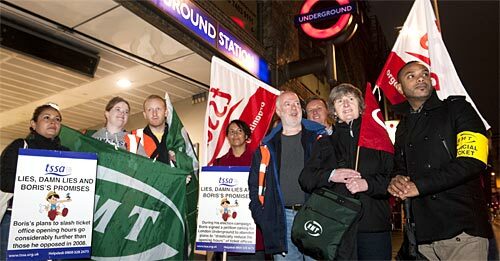 Six days of strikes on the London Underground by the RMT union have been called off after management agreed to reinstate a sacked train driver. Strikes were originally called to demand the reinstatement of four drivers over their involvement in the previous strikes against job cuts in October 2010 (pictured). These were called off when three workers were reinstated or re-engaged (meaning re-employed on the same pay but in a different job) and it was agreed that Arwyn Thomas would also be reinstated. However, management reneged on the deal to reinstate Thomas, an active union rep and driver with 30 years' service, so new dates for strikes were scheduled. Management even attempted to pay him off to leave quietly, offering him £75,000 to sign a compromise agreement, but he refused. On Wednesday 22 June an employment tribunal ruled that Thomas was unfairly dismissed. The following day, London Underground caved in and agreed to reinstate him. The tribunal did not order him to be reinstated: employment tribunals almost never order the reinstatement of unfairly sacked workers. They just order employers to pay often paltry compensation. A member of the Anarchist Federation stated: "these workers winning their jobs back is solely a consequence of the solidarity of other rail workers, prepared to take direct action, lose pay and be demonised by the media in order to support their colleagues. This should be a lesson to all of us." What lesson is that, exactly? I mean, I believe struggle can pay - can push back the attacks for a while, are necessary. But this 'victory' announcement of 4 re-instatements seems to 'forget' what the original strikes were meant to prevent - 800 redundancies. Those posts have been axed, the union campaign failed - but all hail the fact that union officials got their jobs back! Were they officials? I assumed they were RMT activists, maybe stewards (and maybe with facilities time, maybe). But yeah, I do think it's worth keeping it in perspective that the initial campaign failed and trying to understand why that happened (including the role of the RMT).